Preheat the oven to 450°F (230°C) and line a baking sheet with parchment paper. In a large zip-top bag, combine the almond flour, garlic powder, onion powder, and ¼ teaspoon of the salt. In a large bowl, beat the eggs with the remaining ¼ teaspoon salt. Cut the cauliflower into quarters through the core, then cut out the core and leaves from each quarter in one cut. Trim any remaining core and leaves. Break the cauliflower into approximately 2-inch (5-cm) florets. Add the cauliflower to the egg mixture and mix to thoroughly coat. Transfer to the bag with the flour and shake until the cauliflower is well coated. Transfer the cauliflower to the prepared baking sheet with a little space between the pieces and spray with cooking spray. Bake for 20 minutes, or until the cauliflower is starting to brown, then flip the pieces and bake for another 10 minutes, or until well browned all over. While the cauliflower is in the oven, make the buffalo sauce. In a small saucepan, combine the hot pepper sauce and butter and cook, stirring, over low heat until the butter is melted. Then make the blue cheese dip by combining all the ingredients for it in a small bowl and mix with a fork until the cheese is well incorporated. 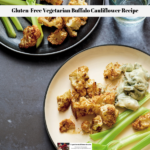 To serve everything, place the roasted cauliflower in a serving bowl, pour the buffalo sauce on top, and toss to coat. Serve immediately, with the dip and celery sticks.